One day while I was attending Goldsmiths I looked up and saw a recognizable face. A girl with long ginger hair and saucer sized eyes was walking through the cafeteria of the East London University. “Is that the Princess?” I asked my classmates. My classmates could not care less that a member of the royal family was attending our artsy school which apparently has the reputation of being one of the most liberal institutions in the UK. I, however, was quite excited. I had seen a princess, an honest to God fricken Princess. The daughter of Weight Watcher Sarah Ferguson! Which is why I was so excited to see the hat, the monument, the fashion statement, that one of my fellow Goldsmithians chose to wear on her head at the recent royal wedding. 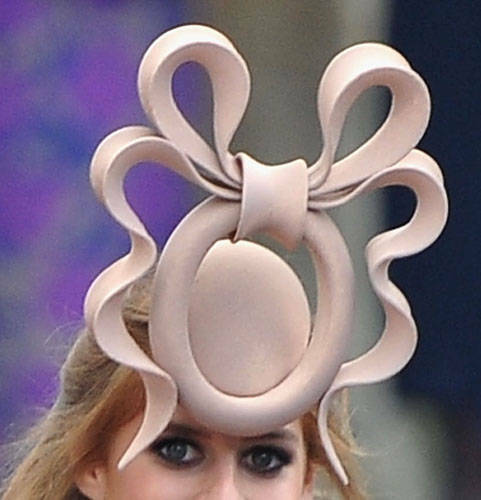 To think, I once shared a cafeteria with a woman who attended the wedding of Wills and Kate with the Flying Spaghetti Monster fashioned into a hat! !